Paschal formwork in use at the W hotel and residences on The Palm Jumeirah. Leading contractors in the UAE are using these formwork systems to facilitate work and speed up the execution of their key projects. 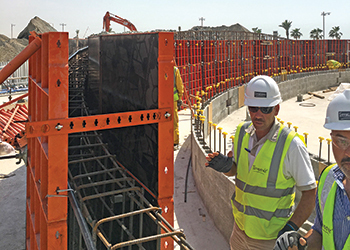 Paschal Concrete Forms, the regional office of the formwork manufacturer, through its Dubai branch office has supplied formwork to several key contractors in the UAE, a number that continues to grow year on year, says Amir Delghandi, the general director. In terms of landmark developments, two hotels on Dubai’s prestigious Palm Jumeirah are being constructed with the help of Paschal formwork: the seven-storey W resort hotel and residences, where the system is being utilised by Terraverde to build double-sided reinforced concrete walls; and a seven-storey five-star hotel apartment tower, where the formwork is being used by General Construction Company for all the vertical elements. At the Expo 2020 site, Al Hassan Engineering Dubai is taking advantage of the ease of use of the system in the construction of a 132/11 kV substation, and two substations (Sahil and Deira Island substations) at Deira Islands A and B.
Seidco General Contracting is using Paschal formwork for the construction of a major project by Damac Properties, Prive by Damac in Business Bay, where it is helping shape the retaining walls, columns and shear walls. Transemirates Contracting has deployed Paschal systems to build retaining walls, columns and core walls on two of its key projects: a five-storey residential and commercial building with two basement levels in Hamriya, and a two-storey residential and commercial building with a basement level in Jumeirah First. Al Shafar General Contracting is utilising Paschal formwork in the construction of a range of projects in the emirate. These include the columns at Phase Three of Green Community expansion at Motor City, and the seven-storey Mohamed bin Rashid Library in Jadaf; and for all the vertical elements at the Mediclinic Parkview Hospital, Al Barsha South Third. ANC Contracting is building all vertical elements of a 15-storey commercial and residential building, featuring a basement and three parking levels, in Burj Khalifa District; and a labour accommodation at Al Qouz Second Industrial Area. Trojan General Contracting has deployed the system for the construction of footing and plinths of 489 villas at Nakheel’s residential development at Nad Al Sheba, Mira Oasis townhouses, Mudon Development, and Maple townhouses. Amana Contracting and Steel Buildings is using Paschal formwork to cast in-situ reinforced concrete walls for the gymnasium building at Deira International School extension, Phase Two, at Dubai Festival City; Al Tatweer Contracting, part of the Belhasa Group, is building the retaining wall, water tanks and core walls of a 14-storey residential building, with a basement and two parking levels, in Dubai Healthcare City, Phase Two. Other contractors that are using Paschal systems include CJ Tec Contracting Company, for the water tanks at the proposed shops and sheds at Ras Al Khor; and Al Hazami Building Contracting, to build retaining wall and water tanks at a seven-storey residential building at International City Dubai that includes a basement. Paschal is a sought-after partner for concrete projects worldwide, with customers in more than 40 countries and 50 years of experience. Set up in 1997 as the main office for the Middle East, Paschal Concrete Forms has since become one of the leading suppliers of modern formwork solutions to the construction industry in the GCC. Paschal Concrete Forms, which is based at the Bahrain International Investment Park (BIIP) in Hidd, has an assembling facility for modular formwork and a stockyard in Bahrain. In addition, it has branches in Abu Dhabi, Dubai, sales agents in Iraq and its Scientific and Technical Office in Dammam, Saudi Arabia.